Portas do Cerco is an area on the Macau Peninsula, built in 1849, in the former Portuguese colony of Macau, now a Special Administrative Region of the People's Republic of China. 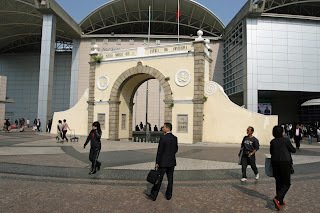 It is near the Macau border checkpoint with Mainland China in the northern end of the Macau Peninsula. The new Posto Fronteiriço das Portas do Cerco (border gate border building) was opened on January 15, 2004. A quote of Sun Yat Sen, the father of Chinese nationalism, "Honor your country for your country is watching you" is engraved in the stone walls of the gate.